especially feeding her family on her irregular wages as a daily wage worker. “My fortune has been changed” due to a program of HUF, NABARD and MYRADA Watershed Development Program that supported landless families like me to improve livelihoods by providing financial support. 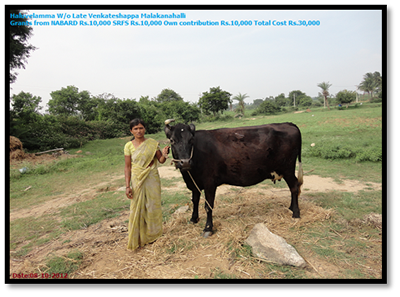 She decided to carry out and bought a high breed cow on 08-10-2012 costing Rs. 35,000. She received Rs. 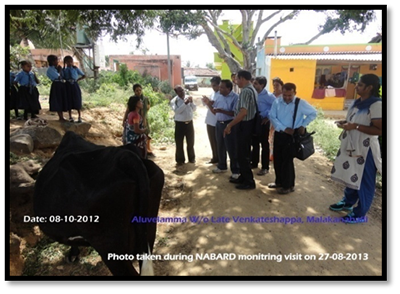 10,000 as grant from NABARD, a loan of Rs. 15,000 from Sanghamithra and put in Rs. 10,000 on her own.